Tag Archives for " Jared Kimball "
Why waste time creating content that doesn’t get you traffic, links, and shares? The problem for many content creators is they aren’t sure what type of content to focus on, so they try creating everything and anything they feel like creating in the moment. That works for some, but not for all (especially not for me). Let’s focus on 3 types of content that are proven to get you more traffic, links, and shares. If you focus on creating these types of content pieces you will start seeing better results. Anyone doing something online whether that’s blogging, selling, writing, video publishing or email marketing love it when their work is recognized by others. Think back to when you were a teenager. Think of times when you put in extra effort into a project or a competition and you were recognized by a teacher, a friend, a parent, or a coach in a public way and on the inside it made you feel good? In this online world, many people would love to have their work recognized. Why not recognize them with a Recognition List Post? When you create this post the right way, you’re bound to get traffic, shares, and links. Here are some examples I pulled from the web that consistently gets results. This blog post is a wonderful example of giving others recognition. With 58 comments and over 1.3k shares, it’s a compelling example of why this type of content gets results. Not all Recognition List Posts have to be blog posts. 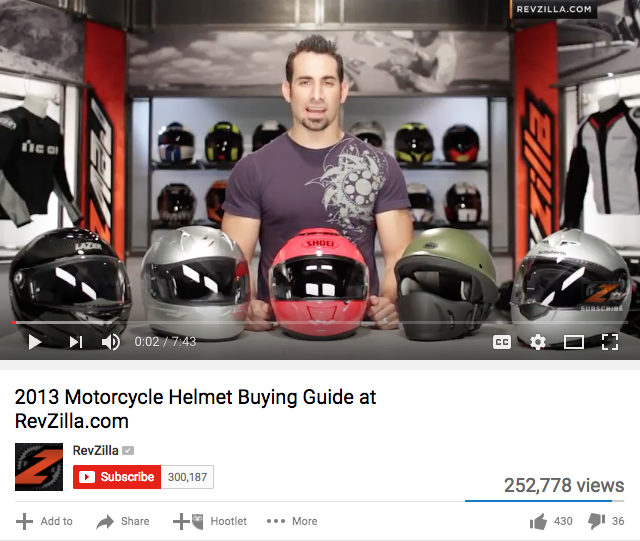 In this video, he talks about 5 different motorcycle helmets in detail to help shoppers get a quick rundown of what the latest trends in style and safety should offer. Focus on something specific – choose a topic like “top LinkedIn marketing experts” or “best marketing Facebook groups to join” if you go too high-level like “top bloggers in 2017” you’ll have a hard time ranking and getting traction vs. finding a more niche topic. Find a topic where you can find at least 100 people – if you can find at least 100 that will give you a ton of momentum for research and will also help you get even more shares than if you only went after 20. The more people you can recognize the more traffic, shares and links you can generate. Next, after you’ve identified your topic and have a list of 100 people – start creating the content. There’s no getting around this. You might balk at the idea of finding 100 people (and yeah it’s a little bit harder), but quality content is what works in today’s online world. You need to give people a reason to visit and then make them feel excited to share your content. Using that approach is like going out and buying 3 or 4 lottery tickets and hoping that your numbers are the winning set. Yeah, you could win, but the odds aren’t in your favor. Create a spreadsheet that lists out the 100 people that you are recognizing. You can copy this Google spreadsheet I created here. It’s on “View” the only mode, but all you need to do is go to “File” > “Make A Copy” and save it to your free Google Drive account. Find their email address, contact page, Twitter handle and other info and add it to the spreadsheet I gave you above. 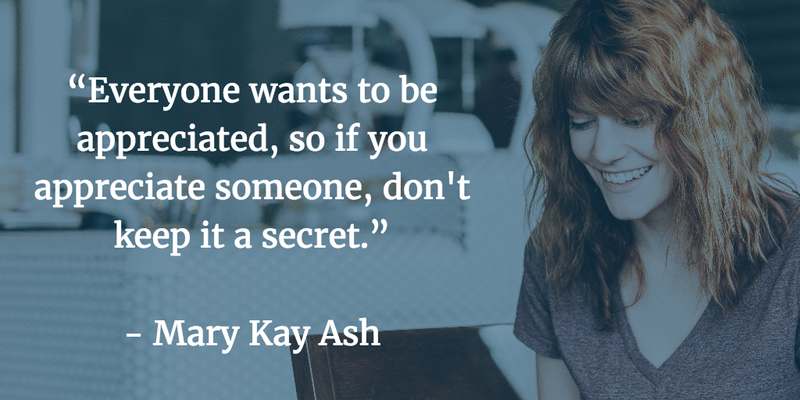 The easiest way to do this is to start brainstorming who you want to target for your Recognition Post. Write down as many people as possible. I do this by making focus a game and use the Pomodoro Technique. Set a timer for 15-20 minutes and brainstorm that list and then take a 5-minute break. After I’ve exhausted my brain’s resources I then turn to Google and Alltop.com to finish up my list. I start with broad search terms like “paleo dieting expert” or “LinkedIn marketing expert”. These search terms bring up thousands upon thousands of results and then I take a few seconds to preview each site and copy and paste their name and website to my spreadsheet. Don’t let yourself get distracted trying to find all their info yet. Your goal during the first phase is to get your list of 100 and then after you have your list go back and start searching for their contact info. Believe me, this is the best way that I’ve found to work through this. Tim Ferriss popularized the work habit called “Chunking” by basically chunking your work into smaller and repetitive blocks, which allows you to work faster and smarter. Filling in most of the information on this spreadsheet is relatively easy except finding the email. 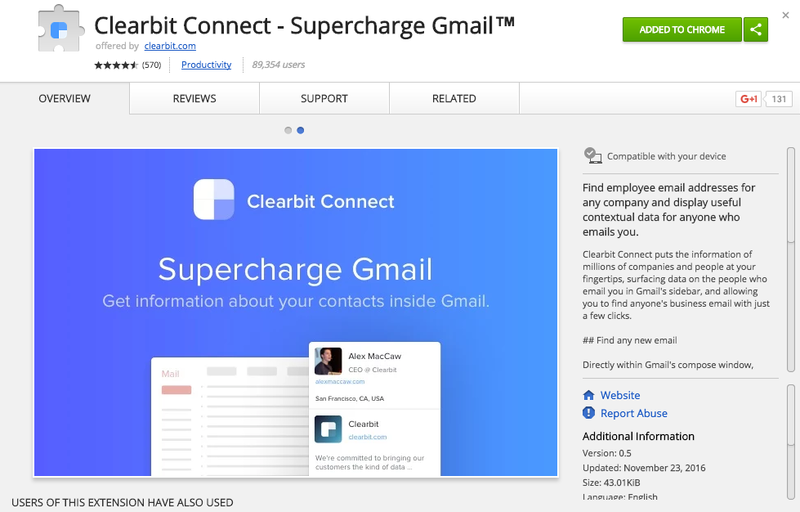 I personally use the free tool Clearbit Connect for Gmail. 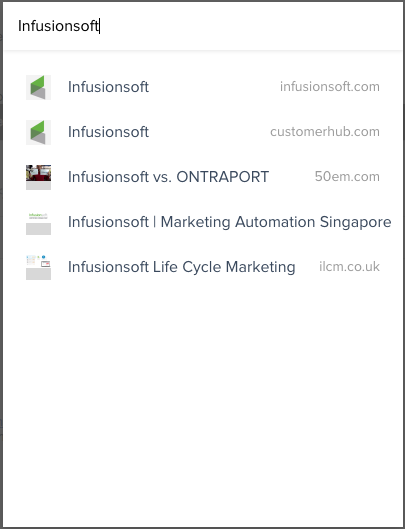 After clicking the Clearbit Connect button a search lightbox will pop up so you can start typing in the organization or person’s name you’re trying to target. Select the company and then it will reveal the email addresses you’re trying to target. 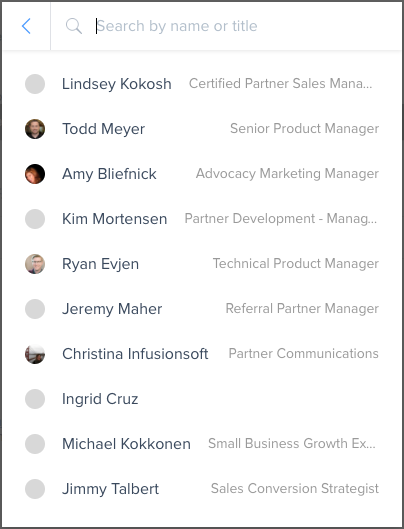 Choose from the list and select the person you’re targeting and Clearbit Connect will put their email address into the email field for you. 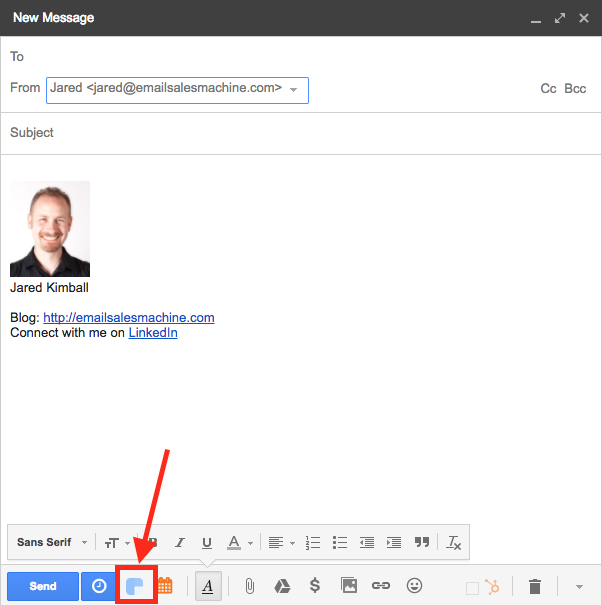 Write them an email, fill out their contact page, or send them a tweet letting them know that you recognized them on your content piece. In most cases, you can expect a 15-25% response rate depending on who you’ve put on your list. If your list is made up of popular and influential people then expect your response rate to be low, however, if you try to recognize people who aren’t in the spotlight very often your response rate will be much higher. Read the replies, respond and start building relationships with them. Using the Recognition List Post is one of the best ways to make connections, grow your sphere of influence and get traffic, links, and shares. The trouble is most Americans never write the book. What if you could leverage the expertise of others and save yourself the 52 weeks it takes to write a novel and create an Expert Guidebook instead? The Expert Guidebook is a powerful way to leverage the expertise of others, give them credit, build goodwill and build your audience. Here are some examples of Expert Guidebooks that receive hundreds and even thousands of shares, likes, and links. Here’s another great example of TheYogipreneur. Here’s one more example of a recently published post about email drip campaigns that uses this type of content that’s starting to naturally pick up organic traffic, comments, and shares. The key to using the Expert Guidebook is to make sure it’s not just a set of organized links to other sites because this doesn’t add value to the user and makes your post look a little strange, to be honest. Instead, you need to organize the content into sections and then include your own insights, advice, and/or reasons why you are choosing those posts to link out to in your guidebook. People need a reason to read and click through the links you designate as the ones that can help the reader get the answers they seek. How Do You Create an Expert Guidebook? Let’s break this down for you step-by-step (note: you will need to be open to using a little HTML or have your web expert set this up for you). Start with keyword research to help you find some keywords to target. Choose 10-15 keywords with fairly high search volume and matches the context of your site. Prioritize the list and rank them according to your #1 choice then your #2 choice and etc. Start with your #1 choice and move to step 2. With your keyword(s) in mind, it’s time to start gathering your resources. I like to start out with creating a high-level outline of the top 5-8 broader topics that fall under your keyword phrase. For example, let’s say you’re targeting a keyword phrase like, “guide to paleo diet”. With the paleo diet, there are some key areas that the average consumer would need to know about the paleo diet. BTW if you’re having trouble creating an outline take a look at Amazon where there are thousands of resources based on your topic. Find a few books and look at their table of contents to get inspiration for creating your outline. With the outline created I’d then turn to Google first. 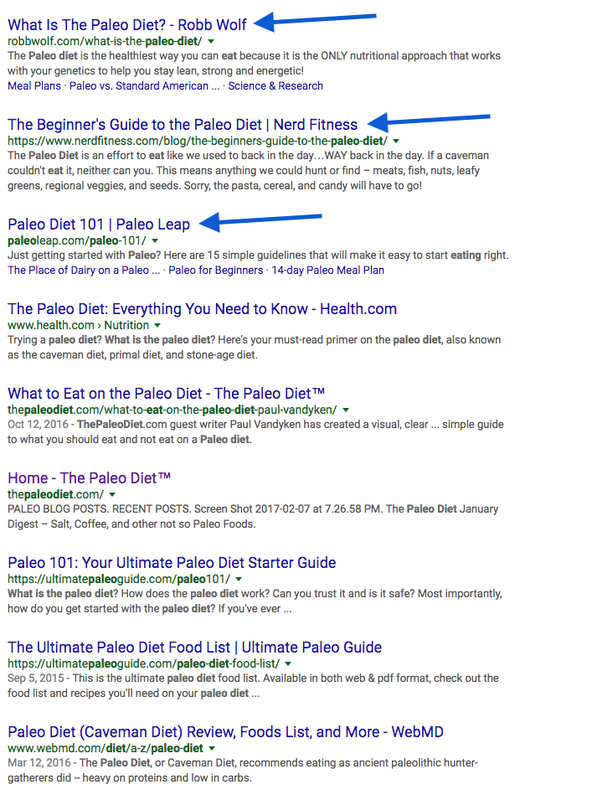 Using Google I’d type in a key phrase similar to the first outline item, “Starting a paleo diet” and then click through the organic results and copy any blog posts that come up and add them to either a document or spreadsheet for easy reference in the future. In this search example I only found 3 posts that help me with this section, however, I’d like to get at least 5 resources under each section. 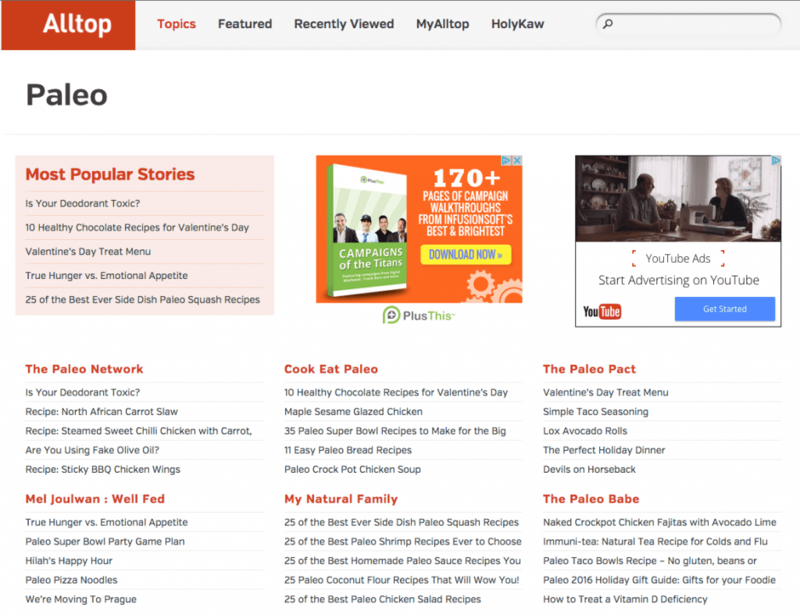 So if the results for Google aren’t producing what you’re looking for I then turn to Alltop.com which is a search engine for the most popular blogs on any given topic. 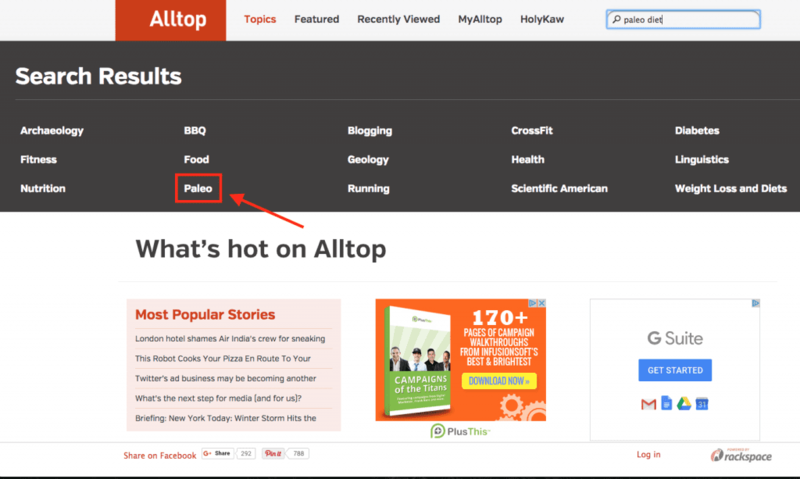 I start off by typing in the broad topic for my post, “paleo diet”. What I like to do is then choose a blog that sounds interesting to me and visits the site rather than clicks through on an individual post. I clicked through on the Alltop suggestions and found an additional 2 blog posts that fit underneath the topic “Starting Your Paleo Diet”. I added the URLs to my spreadsheet and then moved my way down the rest of my outline following this same pattern. Within 30-minutes I had at least 5 links under each topic. Time to move on to Step 3: Build it. With my outline and spreadsheet complete I’m ready to start building the post. I won’t walk you through the technical details on how to build a post like this in WordPress, but I will share some important tips you should keep in mind to help this type of content piece stand out. 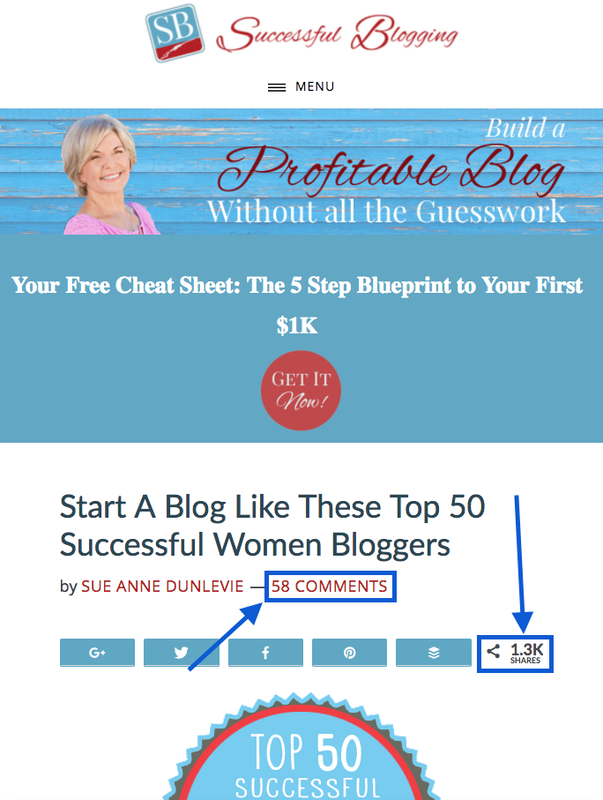 Tip #1 – Use “jump links” on every one of these types of posts. The good news is that creating these types of links is pretty simple and you can see examples along with the technical HTML explanations on this post. 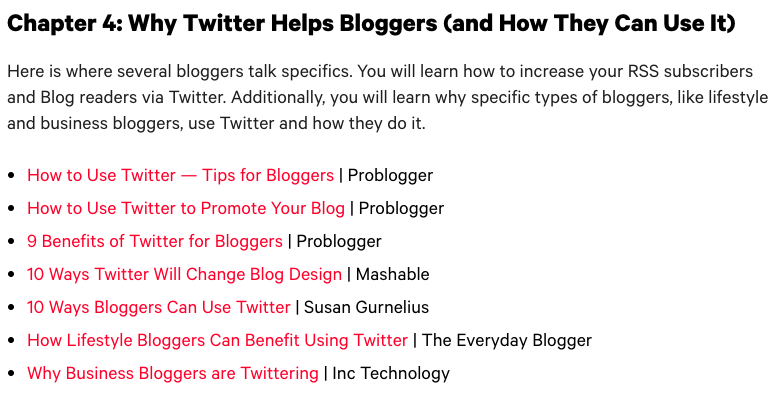 Tip #2 – Try to use the title of the posts as the main anchor text for your links and then name the brand of the site or the author of the blog after that (see the SocialTriggers.com example image above to see how this is formatted. 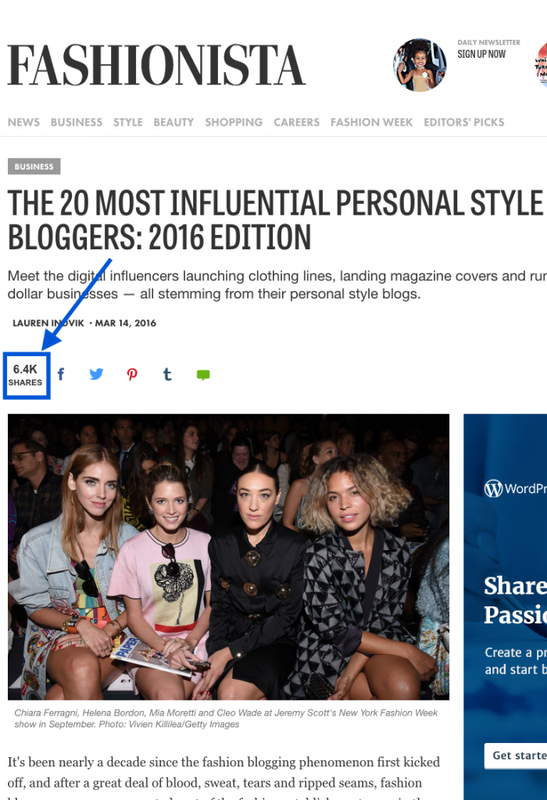 Tip #3 – Let each blogger know that you linked to them. Send them an email, a tweet or use the social media tool of your choice to let them know. One of the best compliments you can give someone online is a link and many people will thank you for that. Use the Expert Guidebook as your way to give back to people in your community, build goodwill and get attention from influencers all while expanding your reach online. I hate list posts, yet I love lists posts (I know, it’s a complicated relationship). Guess what, I never go back to that post. Although lists posts are extremely popular online and yes they do attract traffic most they just list out a bunch ideas, tips or concepts but don’t show you how to take action. Look at this example (a list of neat marketing tools), this one (I think point #2 is pretty funny and hypocritical) and this example (which is just weird unless you love Riesen chocolate candy) to see what I mean by “List Posts” that don’t show you how to take action. With the bad examples out of the way I thought I’d turn the tables and show you a few great examples of Advanced List Posts and why these blogs earn tons of traffic, links, and shares. This isn’t your traditional list post by a long shot. 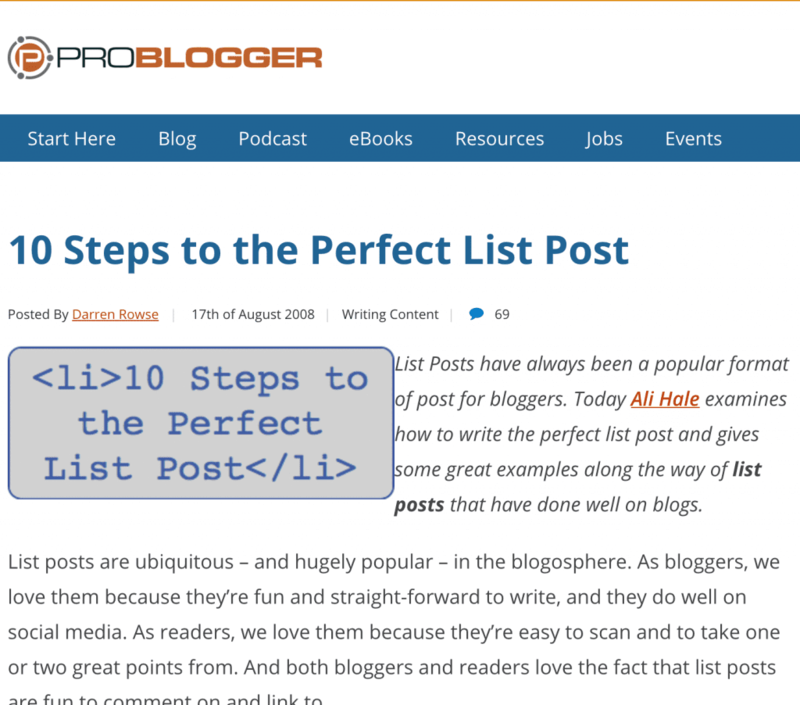 The author breaks down exactly how to create a list post step-by-step. This is a list post that makes you want to take action and helps you create a list post. He sprinkles useful resources, explains what you need to do, how to think and plan your post. Anyone with a desire to create a list post should read this. It’s that good. 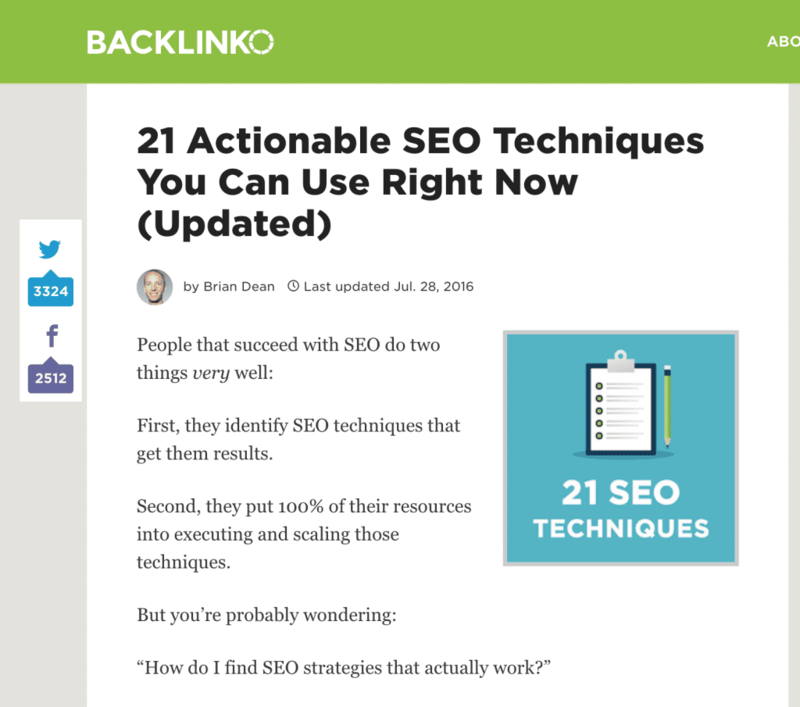 With over 4,500 words (plus videos) Brian Dean not only lists out 21 SEO techniques but methodically breaks down each technique into step-by-step instructions. You can literally skim the post, find an SEO technique you’d like to try out and follow the steps to act on that technique. You don’t need to click through to another website. It’s all right there. Brian takes it up another level by also including video tutorials within the post. These video tutorials help show people more complicated techniques rather than writing down every single step inside the post. The 5 things mentioned in this post are profound. They make the reader think while at the same time breaking down the things necessary for them to avoid failure. 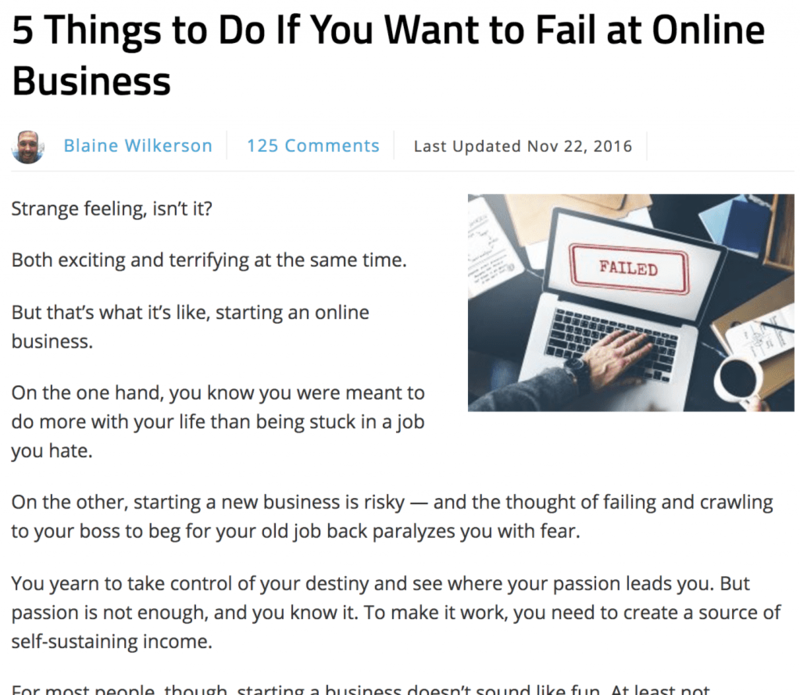 The author has true empathy for the reader who’s trying to create an online business and gives them practical yet insightful ways to achieve success online. Go back and look at this post. There’s a set number of items being shared and I make the effort to break down each item on the list into actionable steps. The key to creating an Advanced List Post is just that – give people depth. There are billions of websites and trillions of web pages online. In this information-rich age people are looking for more depth than ever, so why not create it for them. My philosophy is that if someone is intrigued by my post title and starts to read, then I need to really impress them and help them at the same time. Attention is scarce and very hard to get. Gaining trust online is even harder to earn. The Advanced List post is a great way to get attention and build trust because it delivers results – not just inspiration. Creating an Advanced List Post takes dedication, creativity, time and effort. If you have a deep mission in your heart, then it will provide the fire and passion you need to create an Advanced List Post. With each item on your list, you must look at what others are doing in your marketplace and figure out how you can stand out and earn their attention. Having a mission keeps you focused and helps you push through the feelings that come when you don’t feel like it. Each item on your list needs to answer why it’s important, what it can mean to your reader and how they can apply it to their lives. You can explain through in-depth written content or even create a video that explains each item on your Advanced List Post. You have to be willing to share every single step – don’t hold anything back. What are the advantages of using this tip? What are some disadvantages of using this tip? Where can I find examples of this item on my list? If this one tip was the only one read on the entire post does it answer all of the readers’ questions? How can I break down the steps to help the reader achieve the result this item mentions? If you’re stuck, ask yourself those questions they’ll help you get unstuck. Keep driving yourself and you’ll find unique ways to explain each item on your Advanced List Post. Coming up with list ideas is challenging for some people. If that’s you it’s okay, and hopefully, this little exercise will help you find some list ideas. Grab a piece of paper – yes real paper and a pen. This doesn’t work quite as well on your computer or iPad because there’s something magical about writing on paper that technology isn’t able to compete with. With your paper and pen in hand let’s run through a few exercises to help you think of Advanced List Post topic ideas. Imagine you’re talking to a potential customer – what are the common problems you hear? In most businesses, there are around 3-7 common problems that come up when someone wants to purchase something. What are the problems for your potential customers? Write those problems down and put yourself in their shoes. With one problem in mind write down the exact things they would need to know in order to solve the problem. Those items are the foundation of your post. With your items written down, you need to identify the best one and place it in the beginning because truthfully most people will only read the first one. If they don’t like the first item they won’t continue reading. By identifying your best tip, item, idea or etc. and placing it at the top of your post you’ll have a better chance of compelling people to continue reading. We’ve all heard the saying that first impressions matter and this is your opportunity to make a stellar first impression, which is why that first part of your post must be spot on. How can I put a small twist on this to make it different? Are there any relevant hot news stories I could leverage? Is there any shocking data or statistics I can use for this item on my list so it stands out? How can this tip benefit the reader in a big way? Don’t take this element too lightly. It’s important and dramatically impacts the results of the rest of the post, so put in the effort and make sure your first tip, idea, item or etc. stands out in the reader’s mind. There’s a reason why most pieces of content fail at generating traffic, links, and shares. It’s because most content creators don’t take what they do seriously. They don’t have a mission, a purpose, or a dream that inspires them to take action, to wake up early, to avoid watching mindless television, to do the work required to achieve their goal. But that’s not you, right? Are you going to take action and create some content? You’re going to do what’s necessary to get you where you want to go? Whether that’s more clients, customers, traffic, links, or shares you’re going to put in the effort? If not, you’ll be in the same exact spot this time next year. 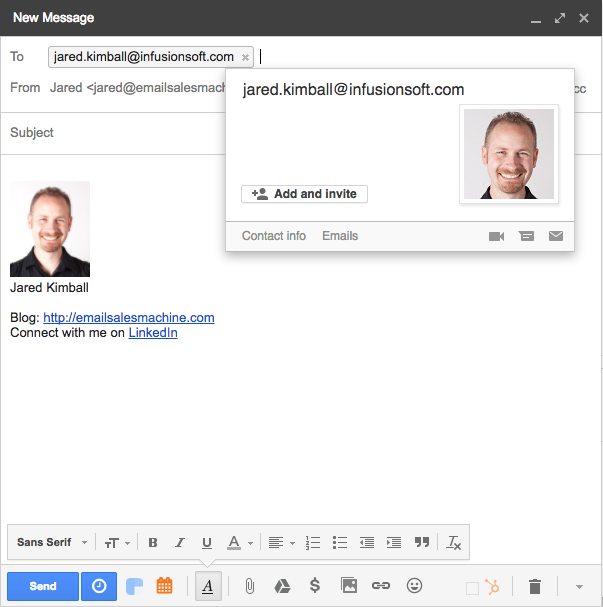 Since 2008 Jared Kimball has worked with small businesses and $100 million companies by helping them launch sales generating email automation campaigns quickly. Download his free guide on How to Increase Your Email Open Rates from his blog EmailSalesMachine.com. You can also connect with him on LinkedIn.